Maybe its the caveman in me speaking but I love meat on the bone. The flavour it imparts is unreal. And we’ve all heard the fat equals flavour adage. Team those two mantras up and add some curry spice and I’ve come up with this! You can have this as a starter or a main.. You decide! Ive come up with a multi purpose curry powder that you’ll really love and it will make the base for 100’s of different curries! Place all the spices in a dry pan and toast for 4 minutes. Place in the grinder then pop in an airtight jar. Place the spices, garlic, ginger, lemon juice and yoghurt in a bowl and mix well. Drop in the chops and ensure they are all coated well. Pop back in the fridge and cover for a minimum of 3 hours. Turn on the barbecue and get as hot as possible. 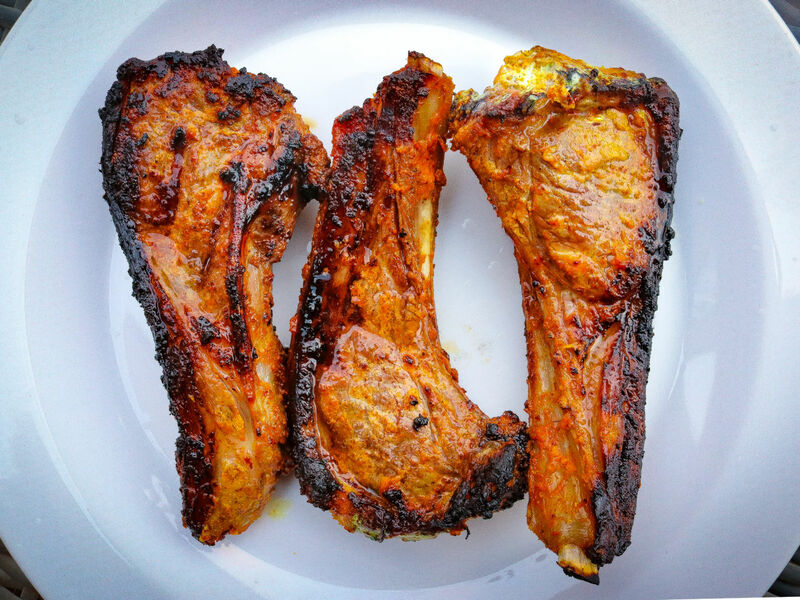 Place the chops on the barbecue and cook for 4 minutes each side until well charred. Allow to rest for 10 minutes. Squeeze over a little lemon juice and then serve.